The Zaino Tri-Foam 6" Oval Applicator is great for hand use with Z-AIO and Z-PC. 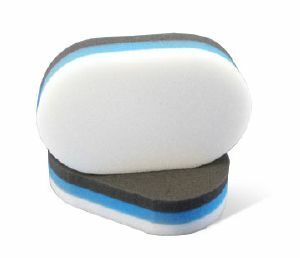 Use the white polishing side of the pad for a little more cleaning or corrective ability in required areas, then flip the pad to the soft black side for finishing off. Photo shows TWO pads. Basket quantity is how many pads you will receive. Note: Some customers like the soft black finishing side of the applicator for use with Z-CS. Any applicator pad used with Z-CS should only be used with Z-CS. See Z-CS product page for details.